Quench by Osmosis is an excellent product. It is so hydrating on the skin , yet will not cause complications as far as irritating the skin. All skin types may use it. Quench contains high amounts of hyaluronic acid, organic shea butter, and jojoba seed oil to provide various lipids that restore the epidermal barrier. It also contains advanced peptides to aid in skin rejuvenation. It is also perfect under makeup and powder makeup. It gives the skin that dewy hydrated look. Your makeup just flows on top of it and looks good all day. The hyaluronic acid helps soften up the lines and makes them less noticeable. 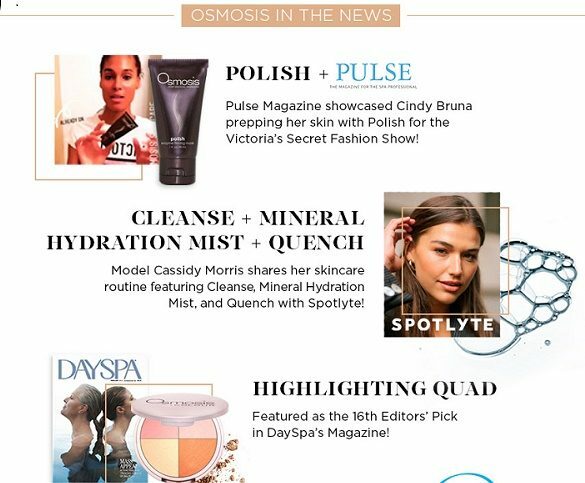 Right now use code quench, purchase $185.00 of Osmosis products and receive a free gift. You will also receive your discount once you log in. Our Preferred Customers receive special pricing. Say goodbye to Rosacea with the easy to use products by Osmosis Skin Care. The newest product to add for rosacea would be the Catalyst. This is so healing and anti-aging. Then you want to purchase their Cleanse, Clear, Mend, Quench and Repair if you want a healing mask. These products come in a kit or you may purchase individually. There are the sample sizes 12.5 mil you may purchase now, 30 mil size or some products come in even larger sizes. If you have not had results before on rosacea, give Osmosis a chance. I have so many testimonials from rosacea clients on how Osmosis changed their skin. You will find your skin is calmer, the red will slowly disappear and you will have the beautiful skin you always dreamed of. With rosacea, you want to hydrate the skin and kill the bacteria. Both are imperative. Using a product that drys the skin will only make rosacea worse. Quench is the perfect name for a product that quenches the skin in luxury and hydration. Everyone may use this product, as it is light and non clogging or oily. You may use it daily on top of your other serums or at night for extra hydration for the skin. Quench is gentle enough for those of you that have rosacea and light enough for those of you with acne. With both rosacea and acne you need to keep the skin hydrated. Quench is priced right and gives you results of products that cost double or triple the amount of Quench. It contains Micronized Hyaluronic Acid, which makes it even more hydrating. It has twice the amount of Hyaluronic Acid. More than any other skin care product. It also uses Argirilene for firming and niacinamide which is proven to help restore the skin’s barrier and feed the skin with its own natural moisturizing factors and lipids. Do you have dry skin? Then you want Immerse the wonderful Essential Fatty Acid Omega 6 intense moisture boost from Osmosis. It takes your existing moisturizer a step further. Add a little Immerse to Quench, Osmosis Hyaluronic Acid Serum. Soothes, hydrates, protects the skin, increases moisture and provides antioxidant support. For dry skin, place 1 to 2 drops into Quench. Can be used alone as a moisturizer or dry skin also. Skin may be dry for many reasons. Too much sun, sun damage, cold weather, rosacea, psoriasis, heredity, wind and more. Adding a little Immerse can bring you relief. It also Smells divine. Very natural. 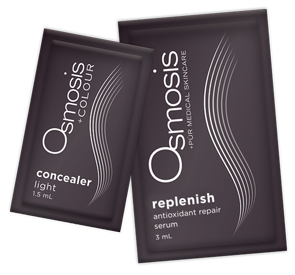 I have 2 wonderful masks by Osmosis Skin Care that you can do at home. Either the Plum or the Spiced Apple Mask. Add a little of the Calming Liposomal Powder and you have another treatment. Mix the powders in with a small amount of mask. Mix well and then apply to clean dry face. Leave on for 5 to 10 minutes. It is always best to start out slow and leave the mask on for 2 to 3 minutes at first to be sure your face is not sensitive. Follow the treatment with Mend or Calm and Quench for hydration. Use Osmosis Light Therapy for rosacea for added results.